Pluto and Charon, the largest of Pluto's five known moons, were seen Jan. 25, 2015, by the telescopic Long-Range Reconnaissance Imager (LORRI) on NASA's New Horizons spacecraft. NASA's New Horizons spacecraft has snapped new images of Pluto — the first taken by the probe during its six-month approach to the dwarf planet. New Horizons captured the new photos — which show Pluto and its largest moon, Charon — with its telescopic camera on Jan. 25 and Jan. 27, when the probe was about 126 million miles (203 million kilometers) from the Pluto system. The images, and many others like it taken over the next few months, will help New Horizons stay on target for a highly anticipated close flyby of Pluto on July 14. "This is our birthday tribute to Professor Tombaugh and the Tombaugh family, in honor of his discovery and life achievements, which truly became a harbinger of 21st century planetary astronomy," New Horizons principal investigator Alan Stern, of the Southwest Research Institute in Boulder, Colorado, said in a statement. This diagram compares images of Pluto and its large moon Charon, taken in July 2014 and January 2015. "These images of Pluto, clearly brighter and closer than those New Horizons took last July from twice as far away, represent our first steps at turning the pinpoint of light Clyde saw in the telescopes at Lowell Observatory 85 years ago into a planet before the eyes of the world this summer," Stern added. "My dad would be thrilled with New Horizons," said Annette Tombaugh, Clyde's daughter. "To actually see the planet that he had discovered, and find out more about it — to get to see the moons of Pluto — he would have been astounded. I'm sure it would have meant so much to him if he were still alive today." New Horizons is equipped with seven different science instruments to study Pluto and its five known moons. Mission team members aim to map the surface composition and temperature of Pluto and Charon, and characterize the geology of both worlds; study Pluto's atmosphere; and search for rings and additional moons in the system, among other goals. 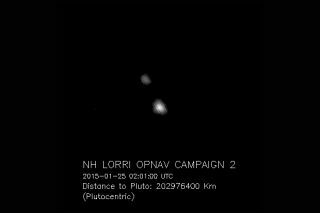 Pluto and Charon, the largest of Pluto's five known moons, were seen Jan. 27, 2015, by the telescopic Long-Range Reconnaissance Imager (LORRI) on NASA's New Horizons spacecraft. Last month, New Horizons began the "encounter phase" of its mission, which will be highlighted by the July 14 close flyby. On that date, the probe will zoom within just 8,500 miles (13,600 km) of the dwarf planet's surface. But New Horizons will be eyeing Pluto intently in the lead-up to the closest approach as well. Sometime in May, the probe should start returning the highest-resolution photos of the dwarf planet ever taken. These images will be even sharper than those captured by NASA's Hubble Space Telescope, mission team members have said. And New Horizons' work may not be done after the Pluto encounter. Stern and his colleagues want to send the probe on a flyby of another object in the Kuiper Belt, the ring of icy bodies beyond Neptune. If NASA approves and funds this extended mission, the second flyby would occur in 2019.